Click to enlarge and print! Let’s start by using crayons to draw details that will show through our watercolor paint. 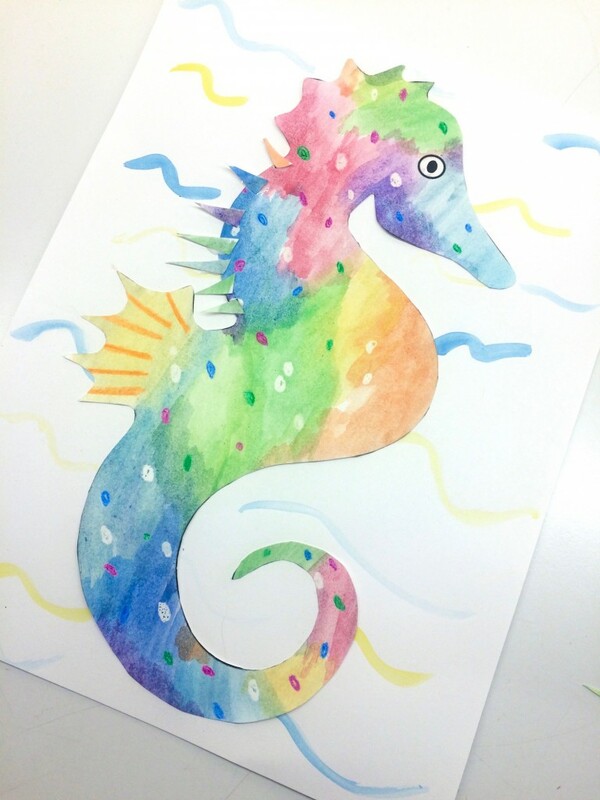 To begin, let’s draw orange stripes on our seahorse’s dorsal fin! Can kids say “dorsal fin”? This fin helps the seahorse stabilize and propel in the water. 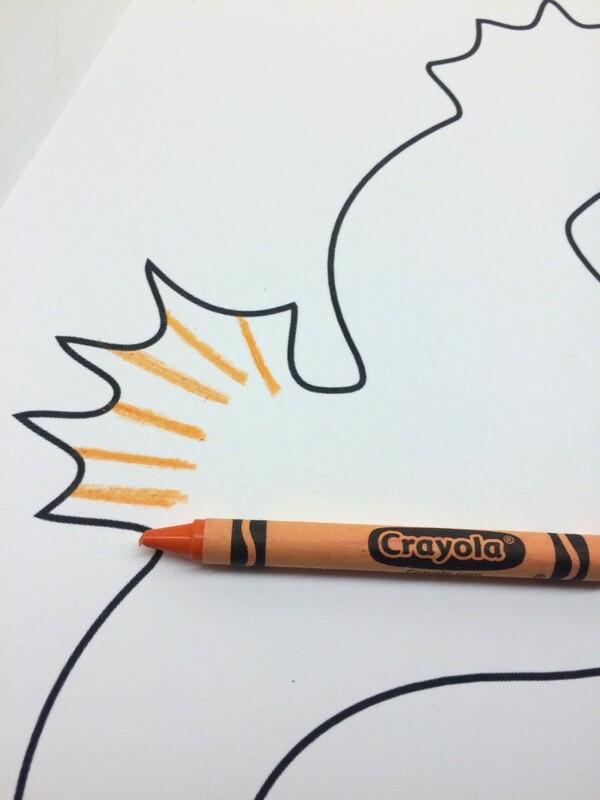 Step 1 (orange stripes on fin): Using orange crayon, draw stripes on the seahorse’s dorsal fin. 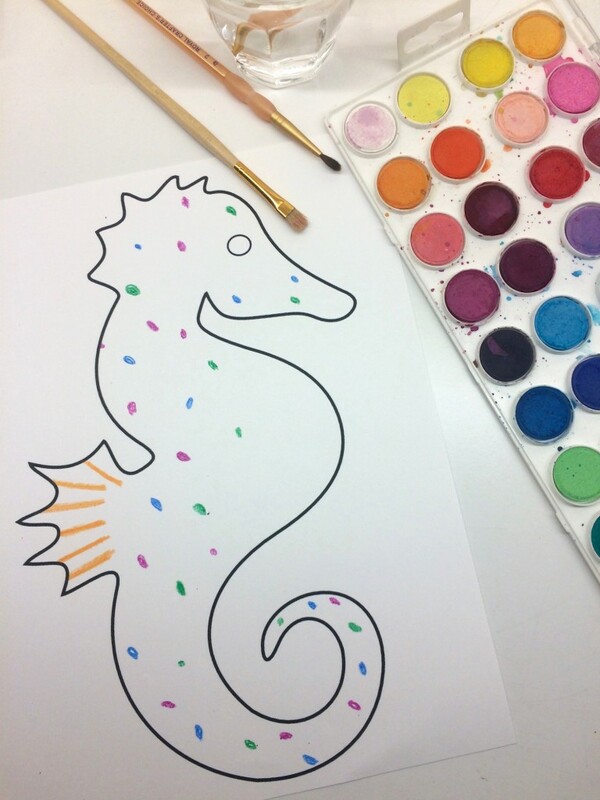 Next, let’s draw spots in various colors on the seahorse’s body. Use one color at a time, asking children to find each color crayon as you go: blue, green, magenta and white. Explain that even though we can’t see the white dots now, they will show up with watercolor! Step 2 (dots with crayons): Using blue, green, magenta and white crayons, make polka dots on the body. 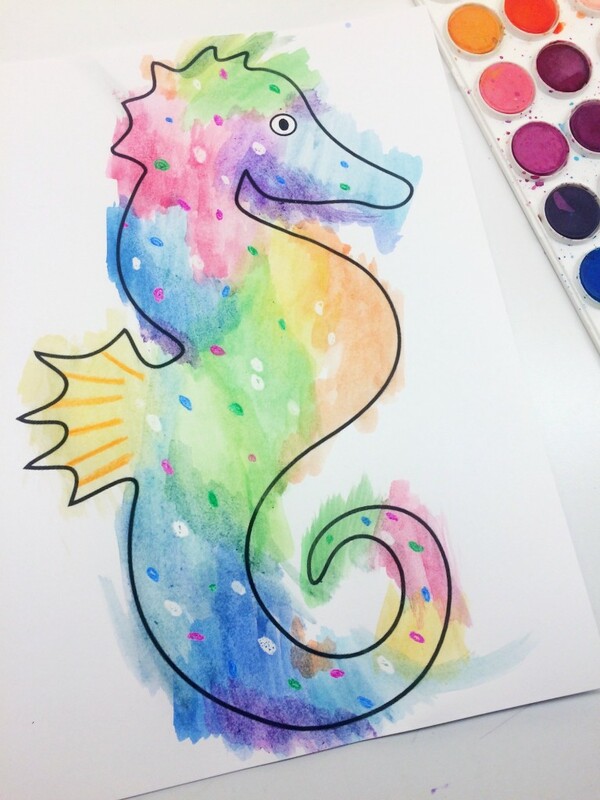 Now we’re going to use watercolors to paint our seahorse! Using Eric Carle’s illustration as a guide, let’s paint color by color. First orange (on his belly! ), then yellow, green, blue, magenta (or pink) and purple. 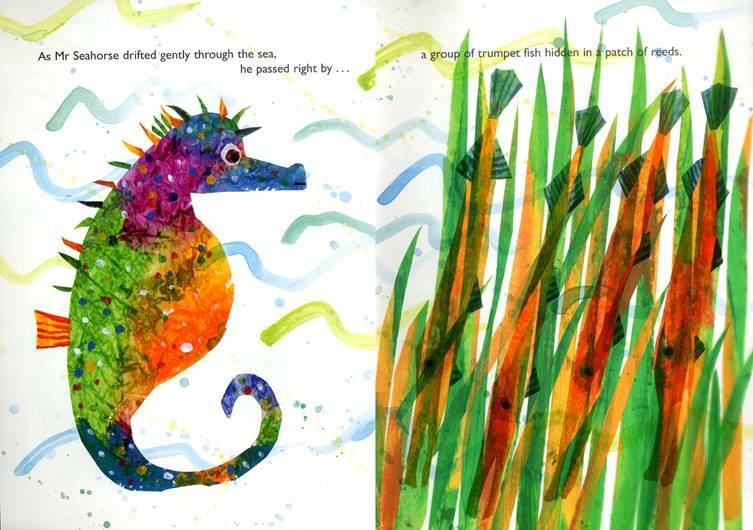 Before painting each color, take a moment to look at Eric Carle’s seahorse and discuss where we see the color. Thoroughly rinse brushes in between. Step 3 (watercolor paint): Paint with orange, yellow, green, blue, magenta and purple then set aside to dry. 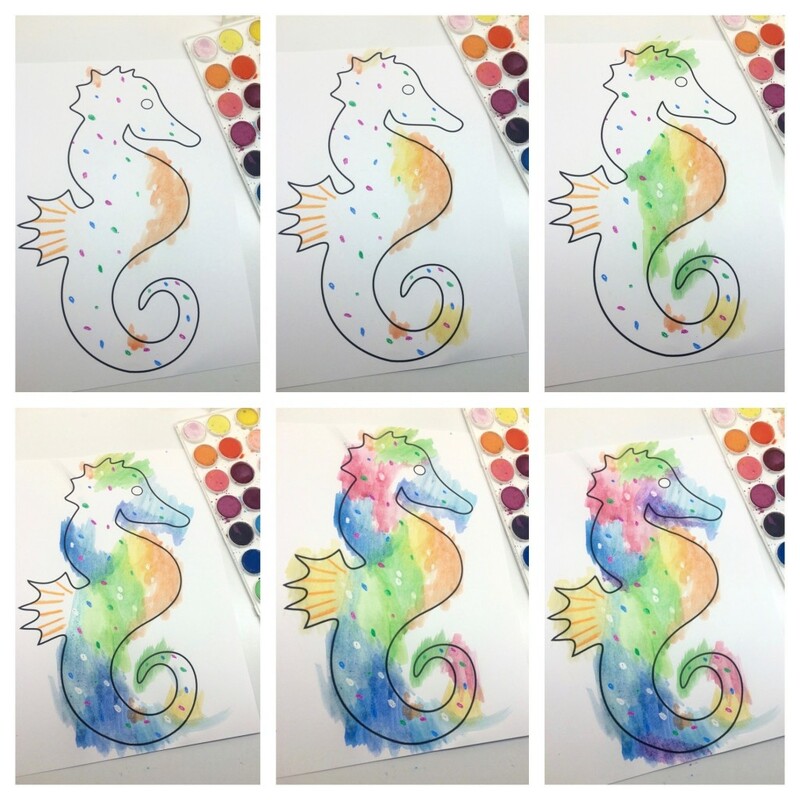 While our seahorse is drying, let’s paint a background. 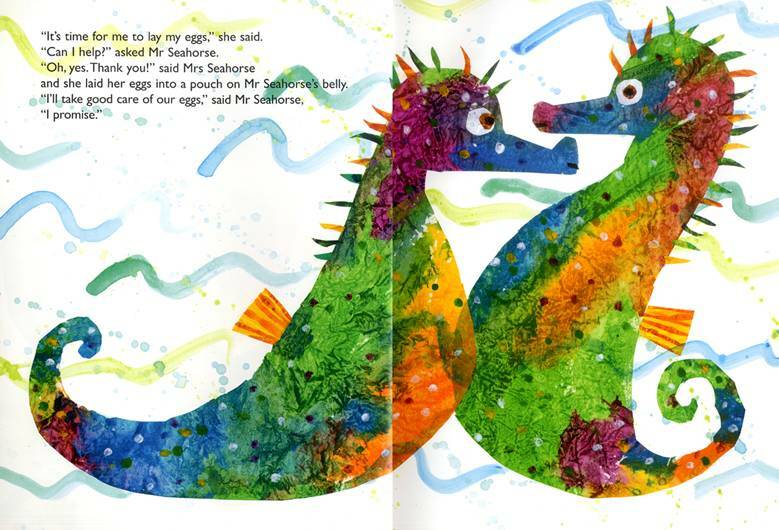 Look at the cover of Mister Seahorse and notice how Eric Carle created a simple background using yellow and blue watercolor on white. 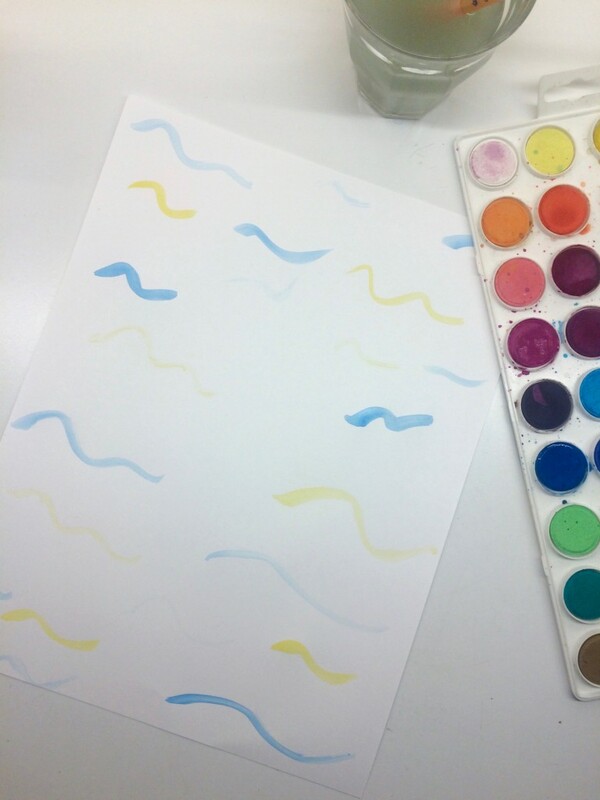 Step 4 (paint background): Using yellow and blue watercolor, paint simple wavy lines for the background. 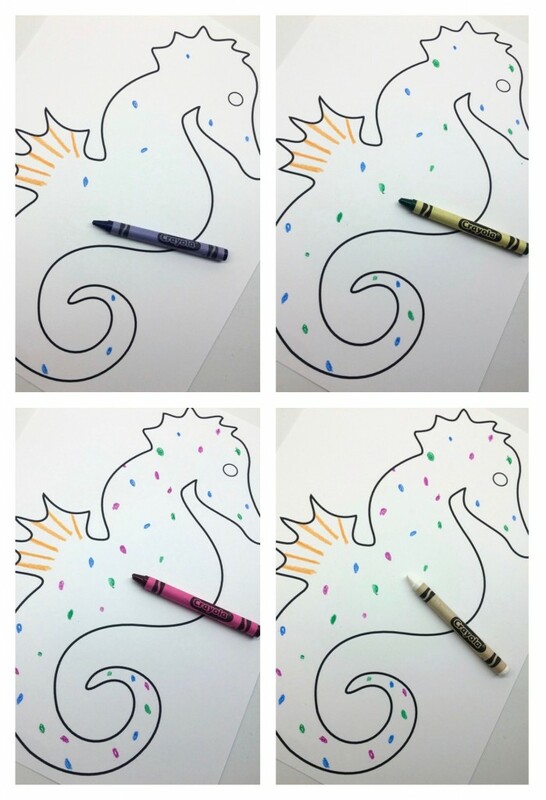 Step 5 (draw eye): Use a black crayon to draw a small circle for the eye on your seahorse. 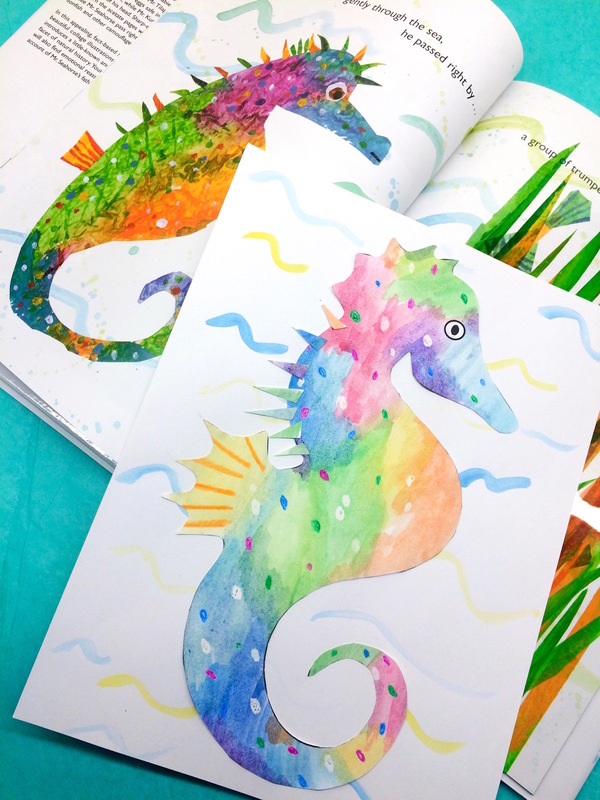 *While papers are drying, spend a few minutes reading some of the book and/or teach some fun facts about seahorses. -Did you now that male seahorses give birth!? The female seahorse lays her eggs into a pouch on the male seahorse’s belly and he takes care of the seahorse eggs until they’re born! -When 2 seahorses fall in love, they dance, swimming together. Sometimes up to 8 hours! -A baby seahorse is called a “fry” and a group of seahorses, a “herd”. -Seahorses have no teeth! Step 6 (cut out seahorse): With the help of an adult, cut seahorse out. 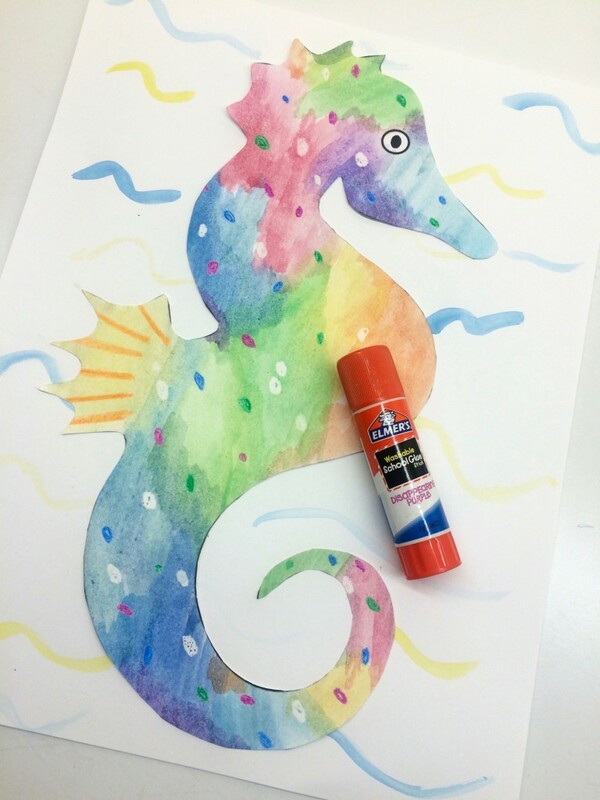 Step 7 (glue seahorse on background): Using a gluestick, paste your seahorse to your background. 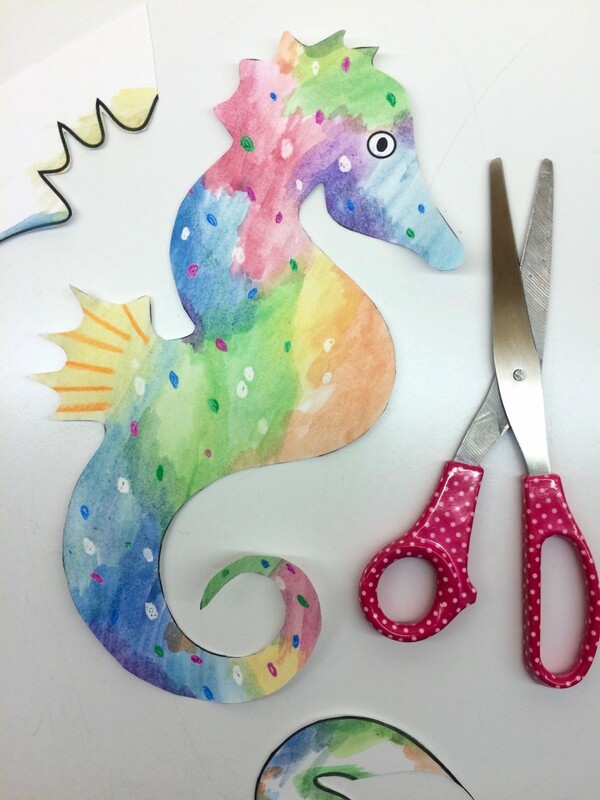 The last step is to cut and paste small paper details on the seahorse’s neck and back like in Eric Carle’s art. 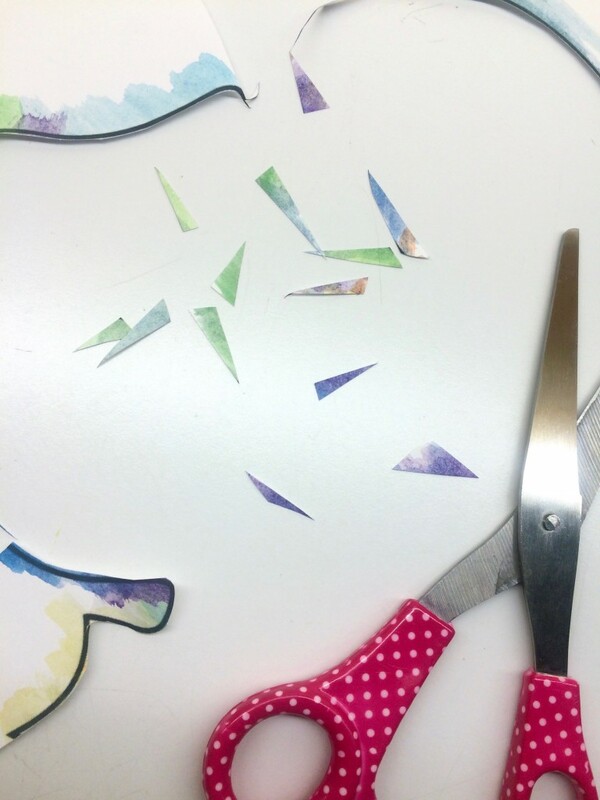 Step 8 (cut & glue details on neck): Using your painted paper scraps, cut small triangles or rectangle shapes. 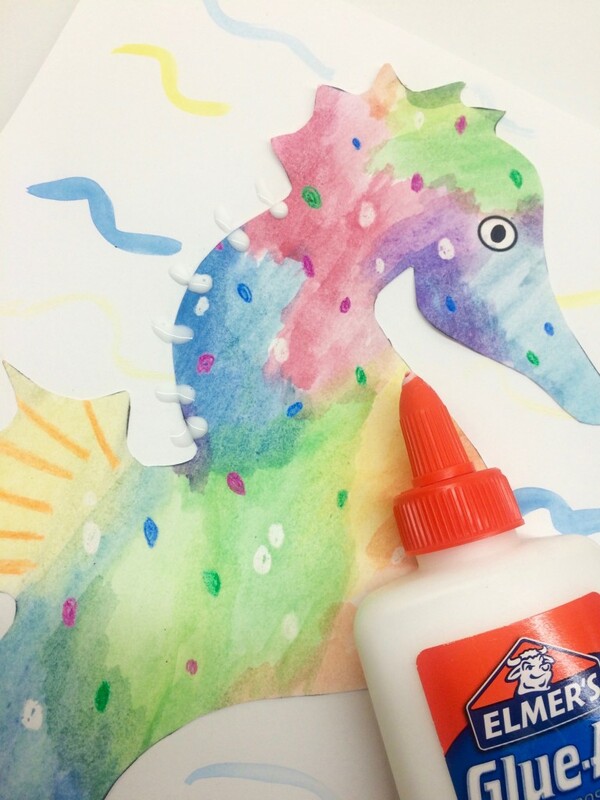 Use glue to attach to your seahorse’s neck and back like Mister Seahorse!